The 2009 Warriors In Pink Mustang (Sally) option package (54S) adds: a Billet style grille without the GT fog lamps; a pink hood and rocker stripes; charcoal leather seats, charcoal floormats, and steering wheel all trimmed in pink stitching; and a special pink ribbon and pony emblem on the front fenders.. The 2009 Warriors In Pink (WIP) limited edition Mustang is only available in Brilliant Silver, Black, or Performance White on the coupe or convertible body style. Take a look at this one. It's a Ford promotional photo of a Brilliant Silver 2009 Mustang Warriors in Pink (WIP) coupe with the new Glass Roof option. A large percentage of the roof panel consists of fixed tinted safety glass. A manual built-in roller blind can be closed to reduce the sunlight. The Glass Roof option can be add to the V6 Premium and GT models for a cost of $1,995. 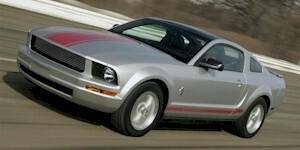 This Brilliant Silver Metallic is a new color for 2009 - replacing the Silver Metallic from 2008. Click here to see all the paint colors offered on the 2009 Mustang with the help of our Data Explorer. The 2009 Warriors In Pink limited edition Mustang is also available in Black or Performance White. The Glass Roof mustang is not new. Steve Saleen has been offering it as an option on his Mustang Saleen conversions since 2006. Click here to see a 2006 Saleen with the Scenic Roof option.